Motorola and Verizon Wireless say they've successfully completed a 5G NR data transmission test between the Moto Z3 paired with a 5G Moto Mod and Verizon's network. Motorola announced the Moto Z3 for Verizon in August along with a Moto Mod capable of adding 5G to the Z3. While the Z3 went on sale over the summer, Motorola and Verizon said the 5G Moto Mod wouldn't arrive until 2019. The test demonstrates that the Mod does indeed bring 5G service to what Motorola and Verizon marketed as the "first 5G upgradeable phone." The companies performed this test in Providence, R.I., using Verizon's 28 GHz spectrum. 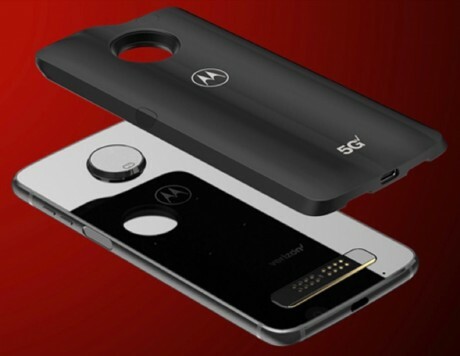 The 5G Moto Mod relies on Qualcomm's Snapdragon X50 5G modem with QTM052 mmWave antennas. The companies used the publicly available Motorola Moto Z3. Motorola says the Moto Z3 will be the "first smartphone with access to Verizon’s 5G network" when that network launches. Verizon is expected to launch mobile 5G service during the early months of 2019. It launched fixed 5G in October. Verizon competitors AT&T, Sprint, and T-Mobile are all clamoring to be first to offer mobile 5G. AT&T recently revealed its first mobile 5G product, the Netgear Nighthawk hotspot. Sprint says it is working with LG to bring a 5G-capable phone to market. Verizon's first standards-compliant mobile 5G network will launch in select areas of Chicago and Minneapolis on April 11th. 5G service will cost an extra $10/month. Motorola and Verizon Wireless hope consumers will buy into the idea of upgrading their Moto Z3 phone with a modular 5G attachment some time next year. The Mod promises to bring a 10x improvement in data download speeds without sapping the battery too much. Verizon launched the first part of its commercial, mobile 5G network today in parts of Chicago and Minneapolis. Consumers can experience 5G service with the Motorola Moto z3 when used with the 5G Moto Mod accessory, which also goes on sale to the general public today.